I was recently lucky enough to buy half a Dorper lamb, freshly butchered and delivered into my hot little hands from its farm on Hindmarsh Island. We haven’t had something as simple as a roast leg of lamb for AGES so it was time to crack out the meat probe. Not too much time needed to be spent googling the right temperature. 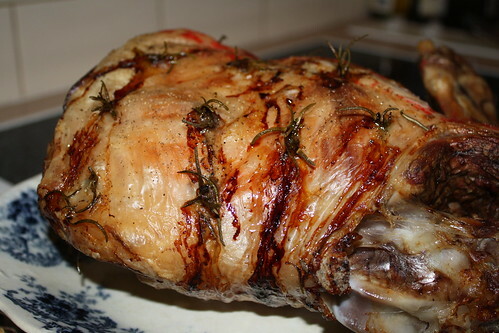 My parents have just acquired an oven with meat probe and had handily cooked a leg of lamb a couple of weeks prior. They cooked to 74°C which, by mum’s standards, was perfect. We opted to cook to 71°C as we like our meat a little pinker. If you don’t have a meat thermometer then you should really buy one, because otherwise you have to do all sorts of complicated calculations regarding weight, oven temperature and whether or not you have a bone in the meat. I can’t help you with that! However, what I can help you with is prepping the meat. Our family tried and tested approach is to stud the meat with garlic and rosemary. If you’re inclined, you can also add anchovy to that mix, but on this occasion I went with just garlic and rosemary. 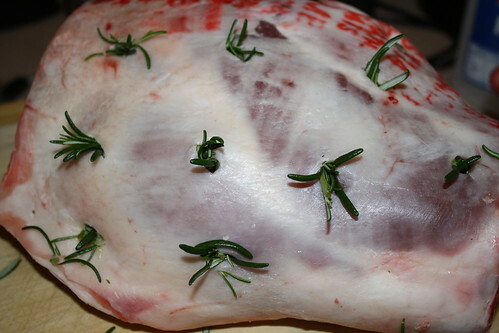 Take a small, sharp knife and plunge it into the lamb flesh to create little pockets. You can see from the photo that you want quite a few. The more you have the more the meat will be infused with the flavours of garlic and rosemary. Now, thinly slice a clove of garlic. You need slivers of garlic so that they’ll melt into the meat as it cooks and when you eat it you’ll get the garlic flavour throughout rather than big bursts of garlic. Stuff the slivers of garlic right into the pockets – no garlic should be sticking out because if it does, it will get burnt and taste bitter. Next stuff in little slices of anchovy (if using) and finish with small sprigs of rosemary, say a cm or two in length. The rosemary can stick out. Do this all over the lamb (including underneath). Then you’re ready to roast! There’s no need do anything fancy like you would do with pork (for crackling) or a fillet of beef. Just straight into the oven until done. Make sure you rest the meat, covered – at least 20 minutes. Once the meat is out of the oven is the point at which we start doing most of the vegetables (roasted ones excepted). Serve on hot plates, with roasted and steamed vegetables and plenty of gravy (make sure you add the juices from the rested meat to the gravy!). Perfect for a Sunday dinner but good enough to be special occasion food.